Such as Your Smatphone. Secure & Simple Pairing for User-Friendly Operation. that Illuminate the Entire Room with 3 Different Settings. You Can Play Your Favorite Music from a USB Flash Drive. Just Plug and Play! Along with the Music. Great for Karaoke Parties. Allows to Easily Connect to Any Non-BT Enabled Audio Device Using an Auxiliary Cable. 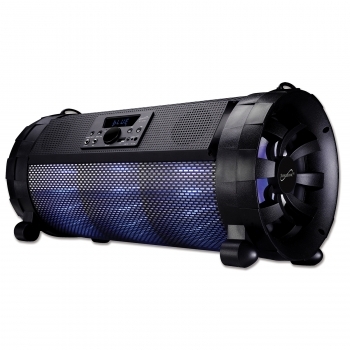 This Speaker Comes with a Rechargeable Battery that Allows You to Take It Anywhere. The 6000 mAh Battery Allows You to Play Music for Up 6 Hours.